Guaranteed Heroes – Get Nominating! Last month, Captain of the Irish Women’s Rugby Team, Niamh Briggs was named as the Guaranteed Irish Sports Hero for 2017. The Irish Full Back was selected for the award following a public nomination process and was presented the award at the Aviva Stadium, Lansdowne Road, Dublin 4. Throughout 2017, Guaranteed Irish is championing six exceptional individuals who have demonstrated a commitment to creating a better Ireland through: jobs, community and provenance. Niamh is the second of six Guaranteed Irish Heroes to be awarded, with artist Maser named Guaranteed Irish Hero for art in January. The remaining four Heroes will be awarded across science, music, technology and food. Speaking at the award ceremony, CEO of Guaranteed Irish, Brid O’Connell said: “Niamh is a true ambassador for Ireland so it is with great pleasure that we name her as the very first Guaranteed Irish Sports Hero today. Whilst we received hundreds of very strong nominations from the public, Niamh had by far the strongest support and was the clear winner of the Guaranteed Irish Sports Hero award for 2017”. The next Guaranteed Irish Hero will be announced this month for their contributions to science, with the remaining Heroes to be announced every two months following: music in July, technology in September and food in November. To get involved and to nominate your Guaranteed Irish Hero, simply email info@guaranteedirish.ie with your nomination or you can nominate and follow the campaign across social media with the dedicated hashtag: #GIhero. 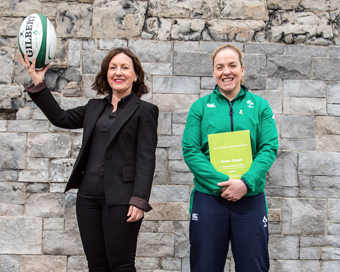 (Pictured: CEO of Guaranteed Irish, Brid O’Connell with the Captain of the Irish Women’s Rugby Team, Niamh Briggs).